If you’re flying from somewhere other than Edinburgh, ignore this paragraph. The only thing you can depend on is the world class Al Mourjan business class lounge in Doha. You can read about that here instead after you finish reading this impeccable summation of events. Departing from Edinburgh we utilized the British Airways lounge. The lounge won’t be featured in architectural digest anytime soon, but it’s a very pleasant place to kill time. Breakfast features warm and cold selections and lunch offered a particularly good soup with a nice variety of tea sandwiches. The lounge never felt crowded and the wifi worked very well, which is what you want. Ah, the comforts of “home”. 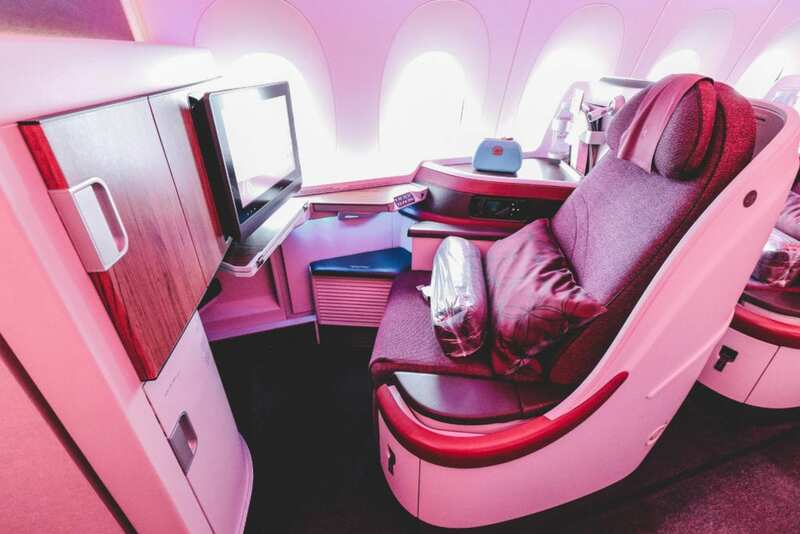 It had been almost a year since I’d flown Qatar Airways on the Airbus A350-900 and I was keen to explore whether seats had tattered, service had slipped or the dine on demand experience felt perhaps less extraordinary than at its introduction. The answer: none of the above. A welcoming purser greeted me at the door, and I was shown to my seat to discover better pillows, a vastly improved home quality blanket and yet another shade of Brics amenity kit. Whether you’re in Qatar Airways private QSuites, or this predating seating configuration, the Airbus A350 is a thrill. To someone accustomed to flying virtually any aging fleet, it feels like a space ship. If you struggled to comprehend mood lighting on planes, you won’t again. Vibrant “intelligent” color floods the cabin, setting the tone for take off, meal service and arrival while *theoretically* helping to fight off jet lag. One thing that definitively does help with jet lag: the cabin offers a more optimal air pressure with more natural humidity. It’s dead quiet and highly pleasant. As you settle in, you’ll find great storage space to the side of the seat below you. The area below the foot stool is a perfect place to store backpacks shoes and other extraneous items which don’t fit in any of the cubbies. If you’re in row 7, you’ll enjoy additional storage space at eye level via the compartment pictured above. Row 7 is the first row of the rear “mini cabin” and offers the best proximity to the boarding door, for speedy exits. It’s my preferred seat on this aircraft in A, E, F or K.
The Oryx one entertainment system remains very solid. It’s still relatively fast, but what really matters is whats inside. The system is packed with TV season box sets, classics, new films and international options. I’d blame them for the lack of great recent films, but I’d be far better served taking my complaint to Los Angeles, where writers block seems to have affected everyone. We don’t need another Jurassic Park, do we? Bed mode in these seats is exactly how it should be. An eye level remote control allows you to change programming with ease and armrests can come down to add extra sleep surface. In a perfect world the TV’s would tilt down for clear viewing from the sleep position, but there’s first world problems and then there’s that. The new duvet was sizable enough to wrap around two passengers, which was oddly comforting, but it’s the improved pillow which made for borderline ground quality sleep. Food on board was dependably excellent. I adore the dine on demand concept, particularly because staff truly welcome the idea of serving you when you wish to be served, rather than on their time. I was reminded multiple times that I can have anything I want, whenever I want, which is very dangerous business. Many airlines struggle to properly activate their caterers, especially from lesser trafficked airports such as Edinburgh, yet Qatar shined once again. If you enjoy spicy food, you’d be remiss to miss out on one of their chicken biryani style dishes, complete with raita. The sticky toffee pudding for dessert needed a caramel sauce, but if that’s your only worry in life it’s best to keep your mouth shut. While some might call it rehearsed, I’d call it professional. Qatar Airways crews seem to manage the art of improvising, while also sticking entirely to the professional stick. Austin from the crew took great care of me and read his lines with far more conviction than any TV cop drama, but also took note of the fact that I was low key and curtailed the theatrics accordingly. What I’m trying to say here is that they really know their product, they’re genuinely passionate about bringing good service and while it may not always be colloquial it’s always good. I can’t fault a single element of the service and love how much time crews take to ensure you know that this business class experience is yours to direct. So, who wants to see QSuites? This sounds like a paid post. Al Mourjan is such a bad lounge.. I have never been paid to fly. I paid for these flights as I do virtually all flights. I’m sorry I couldn’t find something to complain about in the dual level, multi shower, sleeping room, buffet, a la carte dining and top shelf bar equipped lounge. Excellent review of a great airline and aircraft! @Nik: I love the Al Mourjan lounge! The friendly professionalism of the crew, comfy smart seating and the dine on demand makes it tough to beat. Hreat rdvirw. Just what we experienced on our way to PEN and hope for on way bavk from KUL. Love al mourjan too. Qatar lounges in Doha are some of the best in the world. Qatar business class is second to none.